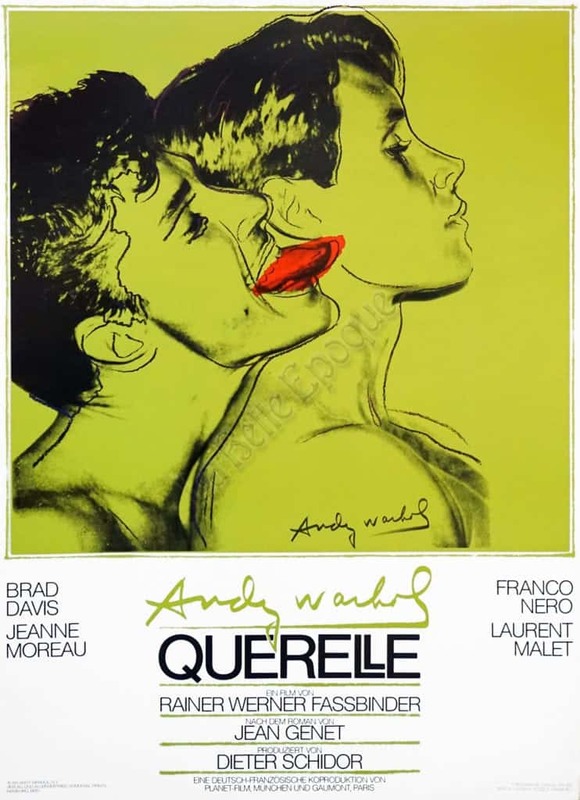 This is a Pop-Art period German movie poster for the film Querelle, directed by Rainer Werner Fassbinder, and adapted from the novel by Jean Genet. Fassbinder commissioned Andy Warhol to design the poster for this film that is about two young sailor's experiences and escapades in a French port. The image for the poster, which was created in two other colors, white and blue, was based on a Polaroid Warhol took of two young men. This image is an idealized representation of the men's features, on a bright green background, marked with fluid black lines outlining the figures, and a bright red tongue. In this poster, Warhol uses a violently sensual minimalism to encapsulate the feeling of Genet's novel and Fassbinder's film. This poster was printed by Verlag und Alleinvertrieb Universal Prints, Hamburg, 1982. Literature: Paul Maréchal, “Andy Warhol: The Complete Commissioned Posters, 1964-1987 : Catalogue Raisonné.” 2014, no. 19.